The photo to the right is a example of our commercial applications. These two huge Bradford White 100 gallon, commercial gas fired heaters supply all of SANDCASTLE Waterpark with enough GPM to keep the entire complex supplied at peak demand. Our commercial design and build division deliver this upon request of the SANDCASTLE maintenance division. We not only deliver the highest quality products on the marked but guarantee a staff of highly-trained, knowledgeable and committed professionals. Our team continues industry training, keeping up-to-date on cutting-edge technology and renewing product familiarity. We offer not only a broad range of heating services, but a diverse list of options to our valued customers. 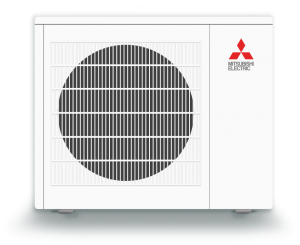 Whether you’re in the market for ductless A/C, heat pumps, gas furnaces, or electric heat, we’ve got your air conditioning needs covered. Plumbing Service And we do plumbing too! Our trained technicians eliminate the stress, mess and hazards of plumbing emergencies. 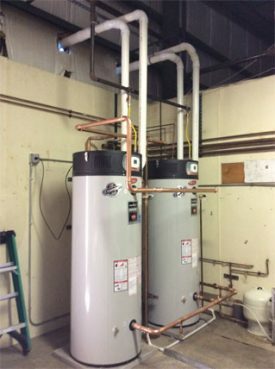 For cleaning drains and sewer lines, repairing or replacing gas lines and sewer lines, hot water heaters, back flow issues, toilet problems, clogs, leaks and anything else you might require, the experts from Lia Plumbing Heating & Air Conditioning and can handle the job promptly and efficiently. Give us call! 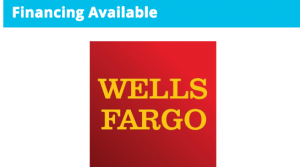 We offer financing through Wells Fargo! Ask for more details.